Keeping golf course greens in their best shape requires a lot of time, effort and money. While the course maintenance staff strives every day to keep the course in perfect playing conditions, sometimes we need help from our guests as well. When playing golf, always remember to repair your ball mark on the green. Repairing ball marks on the greens is a huge help for the golf course maintenance staff. A ball mark that is left unrepaired can cause the grass in the depression to die, not only leaving a scar on the green, but leaving a pit on the putting surface that can knock a putt off target. The typical rule of thumb is to repair your own ball mark and three others. 1. Take your divot tool and insert the prongs into the edge of the turf of the depression. 2. 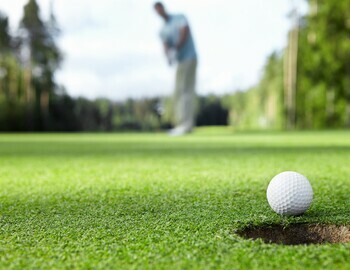 The next step is to push the edge of the ball mark toward the center of the divot in a gentle twisting motion. 3. The final step is to gently tap down the repaired ball mark with your putter to smooth out the putting surface.